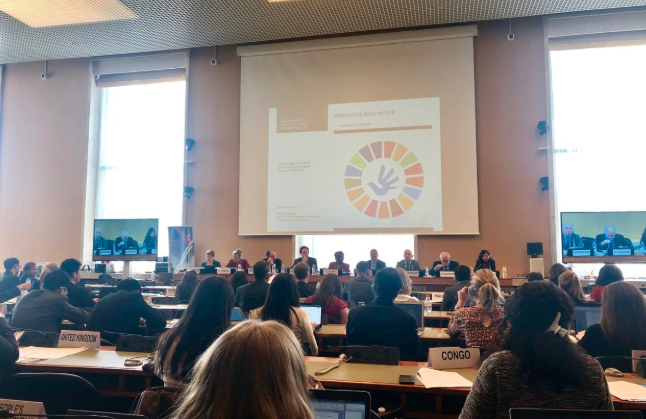 First Intersessional Seminar held at the Palais des Nations in Geneva, 9-10 April 2019. GENEVA: On Wednesday, the Human Rights Council (HRC) held the first intersessional seminar in Geneva on the contribution that the HRC can make to the prevention of human rights violations. During the discussion about the role of the Universal Periodic Review (UPR) recommendations and the prevention of human rights violations, Kunchok Yaklha, on behalf of Society for Threatened Peoples, raised concerns about the Member States claiming some recommendations as “already implemented” when other credible sources show otherwise. When she cited China’s mockery of the UPR recommendations as an example, a representative from the Permanent Mission of China to the UN interrupted the floor and requested the Chair that speakers refrain from country-specific mentions. Rephrasing her statement, Yaklha continued by stating that “a specific country” rejected as “already implemented” recommendations dealing with respecting Tibetans’ right to religious freedom when objective reports show the systematic rights violations of Tibetan Buddhists. The Chinese representative responded that “states have sovereignty” so they are free to choose what recommendations they accept. She expressed concerns that a joint submission on the gross human rights violations in Tibet was removed without any transparency in the process, preventing UN Member States from having access to any of the facts and objective information presented in the submission as they prepared their recommendations.